Special prices for bulk orders, wholesale orders and regular orders. High finish clocks simple and elegant beautiful look. Can be gifted to an individual, family or friend. Ideal Corporate gift option. More shapes/designs can be customised as per requirement in case of volume order. Vintage style photo collage is very attractive photo frame. 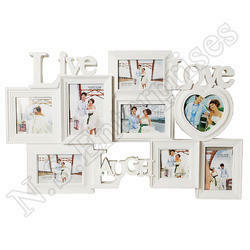 You can hang this collage photo frame in your hall to increase the charm of your room. Keep your sweet memories alive forever. You can gift to your loved ones. Treasure the nostalgic memories in style. High-Quality A3 Size Print. Comes framed and ready to hang. 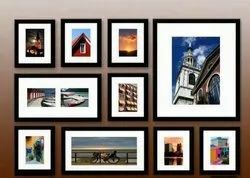 Can be personalized with 6 photos of your choice. A special gift for someone special. MGM TRADERS is the leading and developing Creative innovative Concept of Sublimation industry in range of Coated Ceramics, Wooden sublimation and we do any customized design in Photo Imaging Products In SUBLI Industry. We deals in All kinds of Sublimation Machineries , consumables and high quality of raw materials in sublimation blanks and Wooden Sublimation of Foto Imaging products. Our collage frame displays eight 4 by 6-inch prints in a very contemporary design. Features a high quality synthetic wood to showcase your timeless memories. Attached wall hangings add to their ease of use. We are a renowned firm of Photo Collage that is extremely used in various industries. Perfect gift for any occasion. Made with unisub sublimation wood with valvet back. Gloss finish.